The smorgasbord of music styles cooked by singer/songwriter Adedeji is probably best exemplified by "Odun Ayabo," the fifth track on his latest album Ajo. 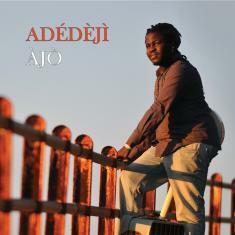 Opening up with sparkling piano, the song gradually adds layers of acoustic guitars and a shuffling beat, weaving across the boundaries of jazz, folk, and world music as Adedeji switches back and forth from African to English. It could be a sneak preview for the future of post-millennial pop as the Internet continues to stir different global influences for young music fans. Beyond the commercial stranglehold of jazz stateside, the genre continues to have its conventions torn asunder overseas as open-mindedness to new sounds and hybrids breathe fresh air into stale conformity. Surprisingly, for all of Adedeji's wildly playful eclecticism, his music is actually quite accessible to the most conservative of purists. For example, the sun-drenched piano, wind-swept melodies, and warm, folksy guitars of "Ile-Ife" are difficult to resist. Originally from West Africa, Adedeji's music reflects his geographic backgrounds, linking his hometown roots with his explorations of European music, past and present. Growing up, Adedeji listened to classical masterpieces from Mozart and Beethoven as well as Afro-Beat pioneers such as King Sunny Ade and Fela Kuti. These days, not only is Adedeji's creativity of two worlds but his living existence as well. "I live between the Netherlands and Greece, and I try to stay connected with home," Adedeji explained. "The difference between here and West Africa is people here usually never go out for concerts and presentations. Music for them is more for parties and special events. The transition for me was smoother because I already had a picture of what I expect it to be musically. But sometimes I feel the African audience is more honest and can help your development more."